Our vacancy rate for the first week of February 2012 is 3.5%. This is high compared to 2.9% last year. We recently acquired 15 new, empty units in the second week of January, that have skewed our data. Without these units our adjusted vacancy rate would be 2.4%, more in line with last years numbers. The graph below depicts gathered data from 2009 to date. Below is a link to a video from the TODAY show discussing the rental market. I wanted you to see it, because this is what tenants see and hear. I'm not sure if this is the same Landlord expert the TODAY show has had over the past few years, but I have disagreed with most of what they have reported. A lot of what they discuss in rentals seemed to be geared towards big city apartment living. In New York City where the smallest apartment costs thousands of dollars a month, I can see negotiating a kitchen remodel, but I can tell you that this simply is not the case in most of America. Regardless, the significant message is that the low vacancy and increase in the demand to rent is being noticed across the country. As I stated before, I expect 2012 to be a good year with some increase in rents. As you know we have started our preventative maintenance inspections in our rentals. During these inspections we have found some alarming situations. 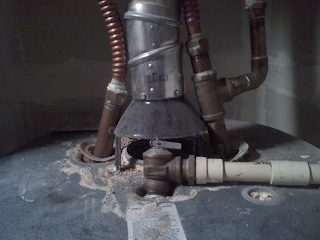 One of which was a water heater that was on the verge of exploding. Imagine having a ticking time bomb in one of your units or even your own home. Luckily it was caught and replaced before any damage was done. We are finding mostly plumbing issues such as leaking faucets, tub spouts, garbage disposals, and leaks under sinks. The majority of the tenants are completely unaware of these issues. This confirms the need to have these inspections completed and repairs made to prevent further damage in your investment properties. Over the years, we have had owners ask, "Does First Rate Property Management require tenants to have renter's insurance". The answer has been "No". The main reason is that we have found that most tenants look at that as another expense that is not needed and therefore, it is our belief that if we did require renter's insurance, tenants may choose to rent elsewhere. Also, we know of a few Boise property managers that do require renter's insurance and they state that tenants get the coverage and then shortly after moving in, they cancel it, without the property manager's knowledge. Additionally, some of these renter's insurance policies may only cover the tenant’s possessions and not the owner's damaged property. So when damages do occur, there is no coverage. Because First Rate Property Management does have clients wanting to make it a requirement for tenants to have some form of Renter's Legal Liability coverage, we have been investigating a Renter's Legal Liability Policy, which allows us to add tenants who voluntarily enroll for a monthly fee of $14.95/month, which is paid for by the tenant. This is additional coverage at no cost to our owners, but certainly to their benefit. In fact, we are told that if you told your insurance agent that all of your tenants were enrolled in the program, you would likely be eligible for a discount on your own insurance. We encourage all of our owners to pose that question and let us know. If after reading this, you find yourself thinking that you may want to make this mandatory for your property, we certainly can do it. But do remember that some tenants may choose to rent elsewhere because of the additional requirement and expense. It is my belief that such requirements, like renter's legal liability, will become more prevalent within the rental market. Below are some FAQ's. Your comments are always welcome. What is Renters Legal Liability™? Renters Legal Liability™ is a community based property damage liability program. The Renters Legal Liability program enables residents to acquire $100,000 of property damage liability protection. Renters Legal Liability is an innovative risk management tool designed to fulfill tenants’ contractual obligations specified in their lease agreement. As an FYI, First Rate Property Management's lease does obligate the tenant to cover any damages caused by their neglect as well as to indemnify us as the property manager and you as the property owner. However, in large losses, it is very uncommon to actually collect from the tenant. Having this policy, would enable us to actually collect. Renters Legal Liability™ provides protection for financial responsibility if a tenant originates and causes damages/losses to your rental property. The program covers five ‘perils’ for accidental resident ‐ generated loss. They are: fire, smoke, explosion, water discharge, and resident induced sewer backup . These five perils account for over 95% of resident ‐ generated losses. Coverage for a single occurrence is up to $100,000. Under the program, damages are paid in priority – to the property owner for damage to the building, to non ‐ responsible, impacted residents up to $10,000 for their damage/loss, if monies are available, and then to the resident responsible, up to $10,000 if other damages do not exceed the per ‐ occurrence limit. How is ‘traditional renters insurance’ different? The insurance commonly referred to as an HO ‐ 4 policy, or renter’s insurance, is coverage purchased by the resident, in his/her name. The policy typically covers the resident’s personal belongings, and liability coverage. HO ‐ 4 policies can be customized to cover various perils, or ‘risks’ and broadened to include damages that were not caused by the resident. For each level of coverage needed, insurers set rates. Total premiums depend upon coverage selections and the loss history of the resident. Who is insured by the program? First Rate Property Management is the insured with administrative control to add tenants who choose to enroll. Is First Rate Property Management selling insurance? No. First Rate Property Management is allowing tenants to participate under our community ‐ based program. Why would a tenant want to have Renters Legal Liability™? Residents who enroll have easily satisfied the lease requirement to indemnify the property owner and manager against property damage or loss that they are responsible for causing within the rental property, subject to a limit of $100,000. There is no additional application form to complete, nor quotes to obtain. Once enrolled, the resident can pay the small monthly cost with rent. No further notices are sent. There is no need to worry about keeping the program coverage in place.